I'm no fan of coffee. I just have to make that point right now before I describe what was for me one of the most surprising games of PAX West 2017, Coffence. As a stalwart tea drinker the idea that I could possibly find anything remotely entertaining about a game that features the retention and consumption of coffee is both odd and even offensive. But one cannot deny the fact that Coffence is indeed a joy to behold and is a game that will delight many upon its release early in 2018. Aliens have arrived and they have taken a particular interest in the hot beverage known as coffee. Now, granted, there are myriad different forms of coffee, but that doesn't seem to put off the aliens' delight in this high overrated drink! But anyway, all of this nonsense is the setting for what can only be described as a beat-'em-up without the punching. 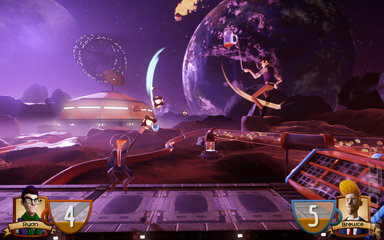 Play takes place over a 2D plane in a similar fashion to Street Figher V. Only rather than people throwing fireballs at each other, the adversaries are facing off wielding a coffee-filled receptacle of some sort. This could be a cup, mug, espresso thimble or even a coffee machine jug. The aim of Coffence is to empty your opponent's carrying device of coffee of its contents into your own. Yes that's right, Coffence is about trying to steal coffee from someone else. Wait, where are you going? Oh don't be like that! Seriously, Coffence is an awesome game! 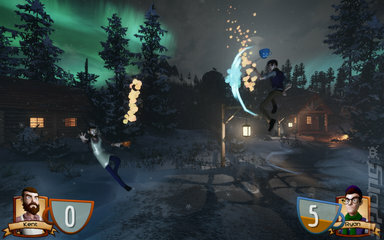 It breaks new ground in hot drink exchange-based combat mechanics. Oh, please yourself. Anyway, for those of you still reading and remaining awake (thanks in no small part to the consumption of coffee, I'm sure) the core mechanic of Coffence relies on players exposing their own cup of coffee while trying to gather the contents of their opponent's via the use of a twin stick based control system. The player moves the character with the left stick while directing the coffee wielding arm with the right stick. By clashing the cups/mugs of coffee together, the contents are spilled and the player must retrieve their own or else suffer the penalty of losing coffee. Again, I personally do not have a problem with losing coffee, but apparently this is a bad thing so I'll just go along with it for the purposes of this preview. The presentation of Coffence is really impressive, with the unique characters all having a very definitive style and despite the early state I played the game in I found it to be very impressive. The sound is similarly impressive as it does much to evoke the feeling of hitting cups of coffee together... apparently. Coffence is due to appear in early 2018 on Windows PC via Steam.